Up until now I have been using Microsoft's Mouse without Borders application to control my two desktop PCs with a single mouse and keyboard. 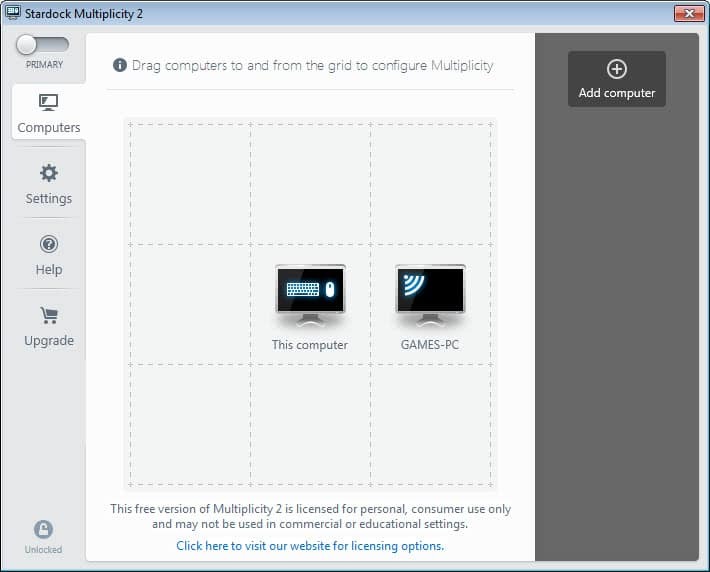 Stardock has just released the second beta version of Multiplicity, a software designed for the very purpose. The free version is limited to controlling one additional PC with the primary PC's keyboard and mouse. Mouse without Borders users will also notice that the free version of Multiplicity does not support features like copying and pasting files and folders between PCs or sharing clipboard entries. Here is a comparison chart that details the features that are only available in the commercial version of the application. The commercial version lets you control up to nine PCs running the program from a main PC, while the free version only one additional PC. To set up Multiplicity on a secondary PC install the program on the computer and select secondary during installation. This displays the computer name and passcode that need to be entered on the primary PC to establish the connection. Once aconnection has been established, the mouse and keyboard work on all connected systems. Free users only have a handful of options besides controlling the different PC with a mouse and keyboard connected to the main PC. This includes options to switch between screens using hotkeys or the mouse, and to darken the current screen when another computer is controlled. When it comes to options on the secondary PCs, you are left with limiting connections to the same subnet and non--routeable IP addresses. The professional version offers two interesting features which deserve to be mentioned. Centralized audio shares audio between PCs so that you will receive notifications no matter on which PC they happen. The data that gets shared is encrypted by the program to protect it from network snooping and other attack forms. Multiplicity is compatible with all 32-bit and 64-bit editions of the Windows operating system. Only 32-bit editions of Windows XP are supported. The centralized audio feature is only available in Vista or later. The program suffers from being very limited in terms of functionality when compared to Mouse without Borders or Sharemouse. If you need to control more than two computers or want to share a clipboard or drag and drop files then the free version program is not for your. And while you could pay $39.99 for the commercial version to do away with the limitations, you get the majority of features in the free Mouse without Borders as well. Synergy is completely free and works on OSX, Linux, and Windows. It’s open-source, so it’ll work on any new platforms too. I’ve been using Synergy for the past 8 years every single day at work to share a keyboard and mouse between my windows and linux desktops. It works great. The Synergy web page says that “All you need is a network connection”. It seems to me that you would have to have two keyboards and two mice to connect the two computers to a network, which defeats the purpose of the software. What am I missing? Mouse without Borders requires a network connection. There is nothing about how the two computers are connected at the Multiplicity web page. Does it also need a network connection? Is it possible to use an ethernet or usb connection between the two? Please excuse my ignorance, but does connecting two computers to a router establish a network connection? Thanks for your site. I visit every day. Well sure, both computers need to be on the network with the software installed. Once that’s done and synergy is running, you only need a keyboard and mouse on the server. Mac users might want to check out donation-ware “teleport” (http://abyssoft.com/software/teleport/. It includes pasteboard synchronizing, drag ‘n drop files between Macs and encryption. this multiplicity eats my CPU! 27% of an overclocked i5…hmm, time to uninstall.